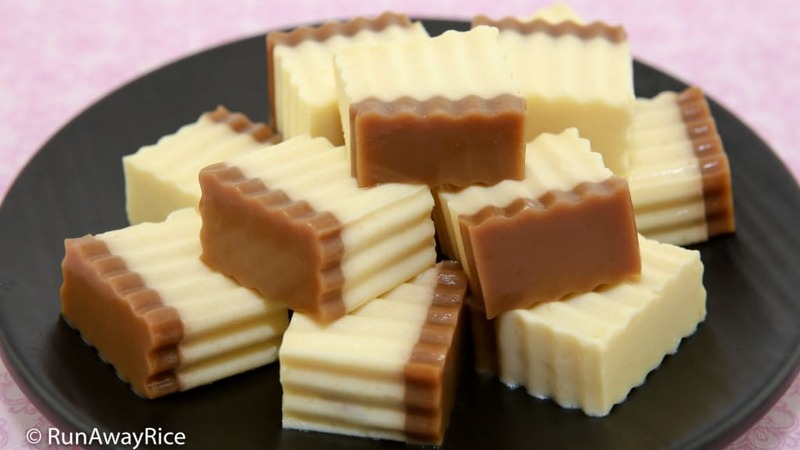 This Coffee Flan Agar Jelly (Thach Flan Ca Phe) recipe combines creamy flan and bittersweet coffee with the fun, jiggly texture of jelly. This chilled sweet treat is a wonderful dessert to enjoy during the summertime when it’s hot outside. 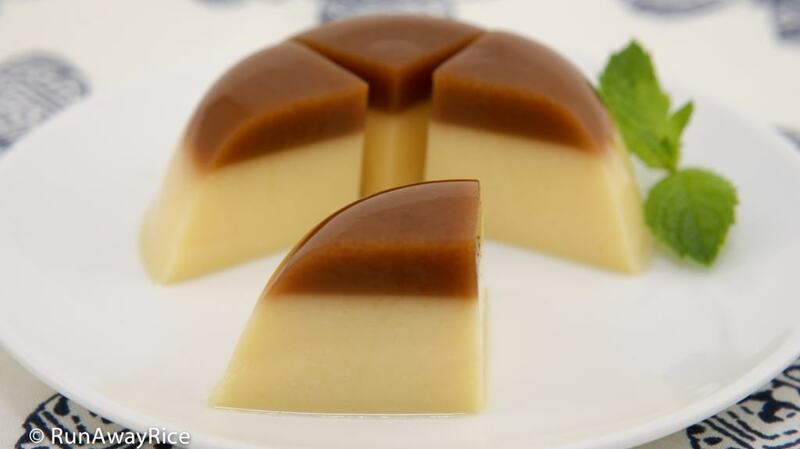 The Coffee Flan Agar Jelly is cool, refreshing and has just the right amount of sweetness. Enjoy this jelly dessert right out of the small bowls or cut into bite-sized pieces and enjoy as finger-food. Give this wonderful recipe a try. It’s sure to become a favorite! Agar agar powder needs to be bloomed or hydrated. Combine with water and allow to rest for at least 15 minutes. Unlike gelatin, agar agar needs to be boiled to activate the gelling properties. When cooking the agar agar powder, make sure it’s completely dissolved. Any undissolved powder will cause the jelly to not set properly and have a gritty texture. You can substitute the agar agar powder with agar agar sticks or strands. 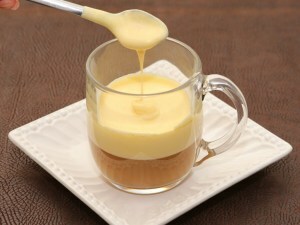 Use .4 oz (10 grams) agar agar sticks or strands for the flan layer and about .10 oz (3 grams) for the coffee layer. Follow the package instructions for the blooming and cooking times. The sticks and strands typically require longer blooming and boiling times than the powder. Allow the coffee jelly to become a soft set: the jelly is jiggly but does not ooze when the bowl is tilted. The surface should be tacky to the touch but not wet and stick to your finger. The timing may vary a bit depending on how hot the coffee mixture is. It should take about 3-4 minutes. 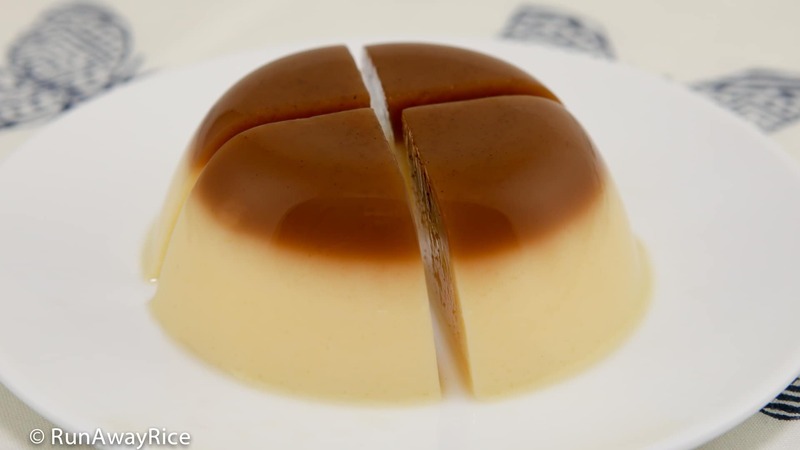 If you let the coffee jelly become firm, the flan layer will not stick to it and the dessert will separate into 2 layers. If the coffee jelly is set firm, place the bowls in the microwave and heat on High for 10-15 seconds to return it to the liquid state and allow to set again. Also, use my trick of keeping the flan mixture warm to help the layers fuse together. Recipe note for the kiddies: If you’re making this for the little ones and don’t want to use coffee, use brown sugar equal to the amount of white sugar and coffee in the recipe, so 1/4 cup + 1/2 Tbsp. 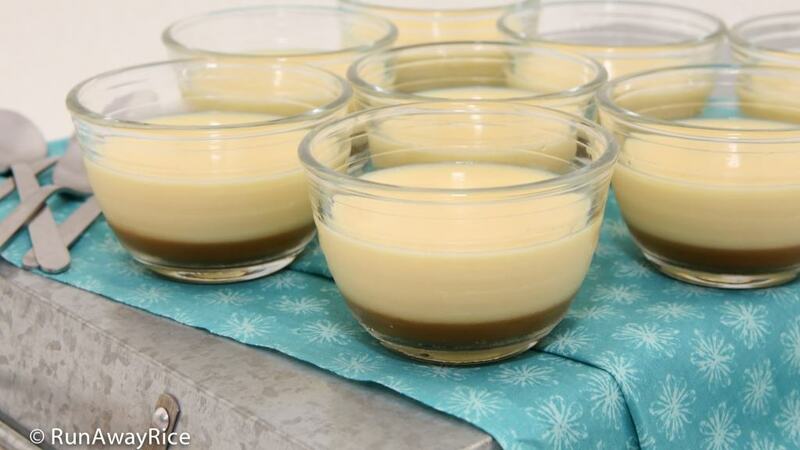 For a flan with a creamier texture, replace 2 Tbsp sugar with 2 Tbsp sweetened condensed milk. Give it a try, it’s really delicious! 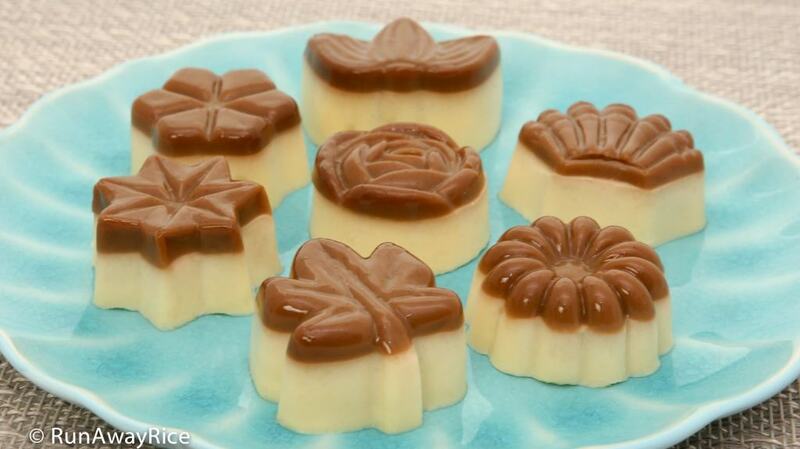 Make the Coffee Flan Agar Jelly using decorative flower molds for more festive desserts. You can also use a muffin pan to make these desserts. Line them with cupcake liners to make it really easy to remove and serve. Optionally, keep it simple by making in an 8 inch x 8 inch dish. Then cut into bite-sized bars or chunks using a wavy knife and serve. Super easy! Store any remaining portions in the refrigerator for up to 1 week. You can make the Coffee Flan Agar Jelly a day ahead and serve at your parties and get-togethers. 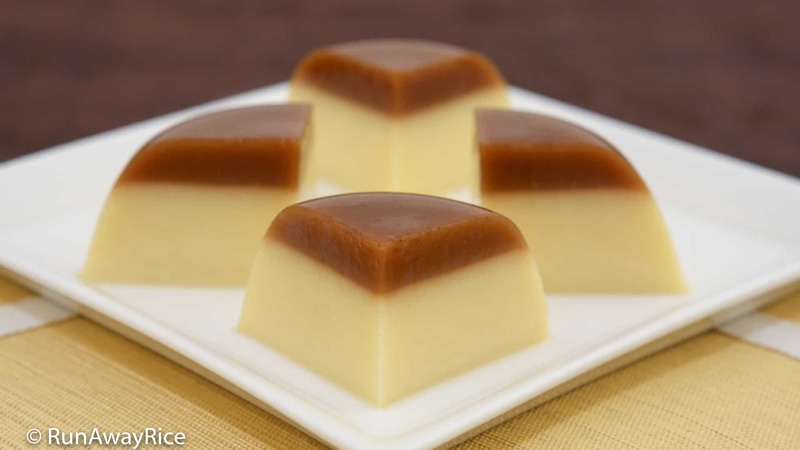 The Coffee Flan Agar Jelly can be served at room temperature. In a medium saucepan, add the water and the agar agar powder. Stir together. Let rest for 15 minutes. Over Medium heat, bring the mixture to a gentle boil while stirring constantly. Continue cooking and stirring until the powder is dissolved (approximately 3-4 minutes). Add the sugar and combine until dissolved. Skim off the foam or any large bubbles from the top. Allow to cool for 5 minutes. During the wait time, start the coffee layer. In a small saucepan, add the water and agar agar powder. Combine together and then let rest for 15 minutes. Crack the eggs into a medium bowl. Whisk together until combined. Transfer 1/3 cup hot agar agar mixture into the eggs and quickly whisk together. Strain the egg mixture into the remaining hot agar agar mixture. Stir the egg mixture to work it through the strainer. Combine everything together. Cook over Medium Low heat until the mixture comes to a gentle boil (approximately 3-4 minutes). Add the milk, vanilla extract and yellow food coloring. Combine well. Transfer the saucepan to the back burner and simmer over Low heat while continuing with the next steps. Heat the agar agar mixture in the small saucepan (prepared in the step above) over Medium heat. Stir to dissolve the powder. Bring to a gentle boil. Add the sugar and stir until dissolved. Add the instant coffee and combine well. Add the light cream and combine together. Transfer the coffee mixture into a measuring cup. Gather 10 small bowls or cups. Spoon 1 1/2 Tbsp coffee jelly into each bowl. Remove any bubbles by popping with a toothpick or skimming with a spoon. Let the jelly set for 3 minutes. Strain the flan mixture. Spoon 6 Tbsp flan mixture into each bowl. Avoid pouring the flan mixture directly into the bowl as this may break the coffee jelly. Pop any bubbles using a toothpick. Place the bowls into the refrigerator and chill for 2 hours or until set firm. Run a spatula around the jelly to separate from the bowl. Invert the bowl onto a plate and unmold the jelly. Cut into bite-sized pieces. This Coffee Flan Agar Jelly recipe combines creamy flan and bittersweet coffee with the fun, jiggly texture of jelly. This chilled sweet treat is a wonderful dessert to enjoy during the summertime when it’s hot outside. 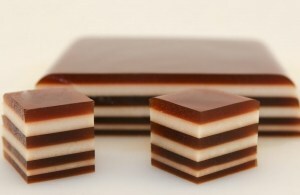 The Coffee Flan Agar Jelly is cool, refreshing and has just the right amount of sweetness. Enjoy this jelly dessert right out of the small bowls or cut into bite-sized pieces and enjoy as finger-food. Give this wonderful recipe a try. It’s sure to become a favorite! You can substitute the agar agar powder with agar agar sticks or strands. Follow the package instructions for the blooming and cooking times. Allow the coffee jelly to become a soft set: the jelly is jiggly but does not ooze when the bowl is tilted. The surface should be tacky to the touch but not wet and stick to your finger. If the coffee jelly is set firm, place the bowls in the microwave and heat on High for 10-15 seconds to return it to the liquid state and allow to set again. Can I use jelly powder? Thanks! Yes, you can give it a try if you’re familiar with the ratios to use. What kind of instant coffee do you use? I use Starbucks Via Instant Coffee. Hope that helps! Thank you for providing nice recipes, I did the Coffee and Cream Agar Jelly from time to time and did enjoy it a lot! 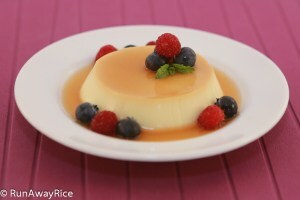 Today, I tried to made the Coffee Flan Agar Jelly Recipe. I did the flan layer twice, but is still unsuccessful. I followed all of your steps carefully but when I add two cups of milk to the egg and agar agar saucepan, the mixture become separate not mixing together smoothly like your; could you please tell me the reason(s) if you know why, thank you so much! I am not sure I understand which is happening when you say the mixture is “separating”? Are you successful with tempering the eggs and combining with the agar agar mixture without it separating or is it separating at this stage? If adding the milk is causing the mixture to separate what kind of milk are you using? Thank you for replying, I had a bad flu and could not write back. I use full cream fresh milk. Sorry I did not describe things clearly regarding the failure with the flan layer. Actually, What happened was when I added the milk in to the agar agar and egg mixture, stirred to combine them but the mixture become fine clotted (separated is not the right word). The ingredients were not mixed like the flan’s smooth texture. Like you asked, maybe i did not use the right kind of milk? Thank you for your kindness, paying attention to my problem. I love your food recipe that have coffee in it! Sorry to hear you were ill and I hope you’re feeling better now. Full cream fresh milk, as I understand it, is whole milk which is what I used in this recipe. Would you have by chance added cold milk to the hot agar agar and egg mixture? Sometimes adding cold milk to hot liquids may cause the milk to curdle. If so, temper the milk like you did with the eggs. Optionally, if the milk is cold, warm it in the microwave and then add to the mixture. I hope that helps and you are successful. Let me know how it turns out for you! I love coffee treats! This hit the spot this weekend as it was pretty hot out! Thanks!